All forum issue been solved now, Some posts been lost, so please re post them. This would greatly expand Emby's usage, and possibly more enterprise level adoption, user templating, user groups, SSO, etc. There are also users who have completely abandoned Emby and ended subscriptions due to the lack of this necessary basic functionality. Context: I am trying to use something like openfire as a Instant Messaging solution which already supports LDAP and SAML2. So this would allow the current user of emby to seamlessly use web-based instant messenger with the same username and password as Emby without the need to enter them into a form. This would also allow universal login to be shared with my home PC's, Spiceworks, Ombii, Organizr, etc. The multitude of possible flexible functionality this could add is truly incredible. THIS NEEDS TO BE DONE, myself and others cannot manage a userbase with proprietary passwords for a single service (with no self-service password reset/recovery), when things that have only months of development implement it within days, easily. LDAP - Development Completed - BETA AVAILABLE! Simply offering a toggle option for auth to send plaintext or encrypted passwords would work just fine. It is ironic to claim the need to be overly security conscious of user passwords, while lagging behind on basic SSL. If SAML is implemented, a SAML request/response can just be signed by an x509 and it is just as secure as TLS using SSL. SSL does not need to be natively supported, as it is perfectly possible to run it through an SSL reverse proxy tunnel and have the same effect. As of now username and password is encrypted client-side as security as SSL is not natively implemented. Emby team has said this impedes the adoption of both SSO and LDAP. Please see our SSL request topic; like, comment, and endorse it to show how many people would enjoy/gain from this basic security. Update 1: I encourage others to work on this but I am currently seeing what I can do to develop a solution to this myself. If you have experience in this LDAP/SSO/SAML2/SSL/.NET contact myself, @Luke, @ebr or the Emby team to let them know, any help is greatly appreciated! By everyone! Update 2: I know there is always the question of "well how many users actually want/will use this", so I compiled a list of some of the other threads/sites where people request this (to apparently no effectiveness in motivating the team). Update 4: This FR is now the 4th most liked post ON THE ENTIRE FORUM and the 3rd most liked FR ON THE ENTIRE FORUM (ever), the 1st most liked active FR ON THE ENTIRE FORUM and over 4000 views. Counting endorsements besides those on this thread show over 115 direct requests/endorsements for this basic functionality. Lets get this moving guys, this is getting to be a bit much. Almost 2 years waiting on this now. Update 5 (9/20/2017): This feature request is now the MOST DESIRED REQUEST EVER MADE TO EMBY, sadly, that has not merited any progress at all. The staff has been working on things they believe Emby users want or may want, but it is clear what people want. We can only hope now our wishes are respected instead of being told what we want and having our requests dismissed. Update 6 [2 year update] (10/17/2017): Two years and not a single bit of progress has been made. TWO YEARS!!! To say this is disappointing is an understatement. The entire reason I went from Plex to Emby was because of local user management. THIS IS THE ONLY REASON, so naturally I wanted to have complete control over my users, but after TWO YEARS, still nothing. Update 7 (3/6/2018): DEVELOPMENT HAS STARTED!!! Check Luke's recent comments, if you want to test it out, download the latest beta and install/configure the LDAP plugin to test and give feedback!!! Update 8 (4/6/2018): Development on the LDAP connector has completed from what I gather, not sure if this is only a beta or a primary release; SSO is still a plan for the future but has not been touched. What if you had the ability to "Forget" a series for the purposes of Next Up display. That is, it would no longer show in Next Up - unless you watched another episode. Sometimes you maybe watch a series for a while and, even though there is more of it or more is made later, maybe it isn't as good as the earlier seasons or maybe you just don't have time for it anymore. So you'd like it to quit showing up in your Next Up list so it is less cluttered and you can focus on the series you are actually watching now. If you start watching it again, the "forget" would be forgotten and it would start to show up in Next Up again. #133852 Web client to remember "Tab"
Can each one remember which tab was selected so that if I have shows selected under TV and I go to movies and back to TV it will still have the shows tab selected rather than going back to latest? Here is the latest list of versions for Emby software across the server and clients. For other platforms, please refer to the download page. I will keep this post up-to-date as much as possible, but please send me a PM about anything I haven't updated, or is missing. ok, I'm making this request official. MB server has already all required information (movie UNC paths, boxsets collection path, etc...) and has access to create data already in it. Would it be possible for the server to manage the boxsets folder structure automatically (the shortcut way)? The way I imagine it, when scanning a movie, when MB server sees that it's part of a collection in TMDB, it would create the "(collection name) [boxset]" in the boxsets UNC path (since it already know where it is based on the collections types) and add the shortcut of the movie folder in it (it also knows that since it's in the movie details). The rest would work like it already works right now (boxset metadata, etc...). Am I missing something obvious or this would be awesome? XBMC does it automatically already but it's "movie set" (basically just a grouping without metadata) same for Plex. Come on! give this request some love! Is there a way to set a simultaneous connection limit for each user. I share my server with family and a few friends and sometimes I see a couple with 2 or more active streams from different clients under their user and I would like to limit this to 1 connection per user for them. Please click "Like this" and share it if you want to support this feature. Thank you ! There is a Kodi addon call "gdrive" from ddurdle who can read videos (original and transcoding version) directly from Google Drive. 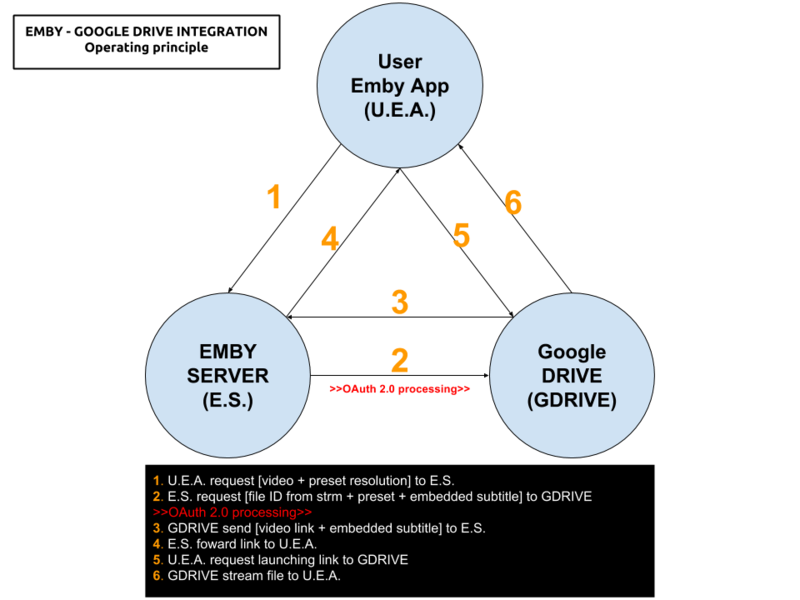 Why not build on this idea to integrate Google Drive as source directly in Emby Server ? In addition, Emby could generate automatically the STRM files from one or many Drive folders. And transcodings are already available with Drive so no need to transcode with Emby server. 1. Cloud is the future and today the cost is affordable. I have a Google Drive Unlimited for $50/month (ie $600/year) and I have unlimited space that is secured against crashes. Knowing the cost of hard drive and the cost of power consumption, its a very good deal. 2. Google Drive transcode video file. This provides different stream quality like Youtube (1080p, 720p, 480p and 360p) and the "image quality/compression ratio" is very satisfying. I can play 720p video on my poor 4 Mbits DSL. 3. You don't need to have a big server. Personally, I opted for a little dedicated server (Kimsufi 2G) for the cost and I can leave it run 24/7! Furthermore, me and my friends can watch movies from anywhere! One of the nice things about MBC is that empty TV folders (after the latest show is deleted) are hidden. This makes Emby look very smart. I know @ebr wants to get rid of this feature from MBC as he sees that this is better as a server feature that can be applied to all clients. I agree. So what does it take to get this useful feature into the Emby server? I'm hoping that asking nicely is enough, I'm also hoping that enough other users consider this feature useful enough ot include in the server. Can we find a way of either reading already created playlists eg for WMP or iTunes or import those playlists into MB. I know you all have been waiting for it, so we're going to make this available to our loyal Emby Premiere users. Although we're not ready to call it beta yet, it's closer to beta than alpha. Everyone is welcome to download and browse around, and the full-feature set is available for Emby Premiere users. Since we haven't whipped up an installer yet, we're posting a portable test build here for you guys to play with. Just unzip and run from anywhere. This build will expire in a few days in order to force you to come back and download a new version, at which time we'll have the installer ready. Currently the app requires an internet connection which allows us to host assets online for easy updating. Right now this is a period of rapid change and development, which is why this model is easiest for us. At a later date we will add offline support. A responsive UI free of scaling. The app is rendered crisply at your native resolution, even at 4K. The audio and video players are based on DirectShow, which is still the high end option for Windows users. Several methods of hardware acceleration are available - QuickSync, Cuda, and others. Supports Madvr - Madvr is embedded and can only be enabled or disabled. Over time we'll expose more Madvr features in the settings screens. Let us know what you think. We've only had a small group working on this, so you can probably expect to run into small bugs throughout the app. Please post them here and we'll get them resolved. And a major thanks to everyone in the dev and test group that has helped with this. While Emby already has recommendations built in based on previously watched items I find they are not all that helpful. They seem to be based on genre only, for example, because you watched a comedy here are other comedies in your library. I do like how the also directed by/appear in recommendations work though. What would be great is if Emby could incorporate Trakt's recommendations as they are much more sophisticated. Trakt's recommendations are not only based off of what you have previously watched but also what your Trakt friends and other Trakt users have watched. It takes user ratings and trending/popular media into account. Ideally Emby would include full Trakt integration allowing users to rate media after watching, view lists and recommendations, and view upcoming media all from within Emby but for now I think recommendations would be a nice addition. Trakt has the potential to give Emby that community feel and allow users to discover new media, find something to watch, and recommend media to other users. That way you can just assign users to the appropriate Group and all settings will be inheritated. If the problem is occurring in the Emby Web app, please remove any custom CSS you may have created and see if the issue remains after that. I would like to be able to mark individual media items or even perhaps entire libraries to be excluded from media scans. I've noticed that even with series that have not had any new episodes in years (and no changes have been made in my filesystem) there is still information being downloaded from metadata providers. I suppose that is to check to make sure it is current/complete, but it is a waste of my network resources which are not plentiful. Perhaps this could be implemented by adding the option to not rescan media that has been marked as locked. 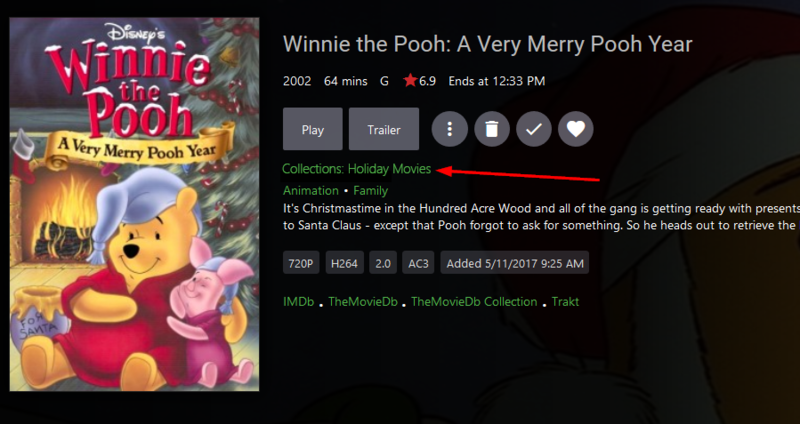 I'd like to request the display of whether or not a movie is included in any collections. Please change the default "Play All" button that appears at the top of a season folder to "Play Next" - I've lost count of the number of times we've accidentally pressed this and started playback at season one episode one. There's about one single use-case for the "Play All" button - you want to watch an entire series from the beginning. Every single other use-case would be to start watching at the first unwatched episode (i.e. "Play Next"). This has been suggested before here: Episode playing and some suggestions - with at least three users (including me) agreeing with the op. It would be great if i could set the server to delete certain shows after a user has watched it. I happen to watch "The Daily Show with Jon Stewart" and "The Colbert Report", everyday, and with "News"ish type shows, there is no need to keep the episodes around. So i would like to set MB to auto delete those 2 shows, 3 days after one user has watched it. From Dec 20 - Jan 1 Emby will be operating on a limited Holiday schedule. This means you should expect slower than normal response times in the forum as well as less development activity during this period. Rest assured, we will be back to our blazing fast development and support schedule with the start of the new year. We hope that all of you are able to enjoy relaxing time with your families during this season as well. Happy Holidays from the Emby team!